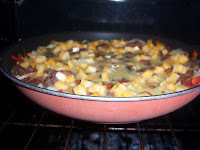 This is one of my go-to's to use leftovers, besides casserole. 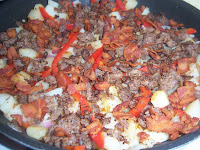 I made the boys breakfast this morning using some sausage & bacon...so I had leftovers. This is really more of a method than a recipe. You can use all veggies, all meat or a combo of both. 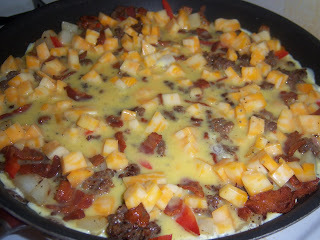 I used my leftover breakfast meats + some breakfast potatoes, red bell pepper, red onion & some colby-jack cheese. 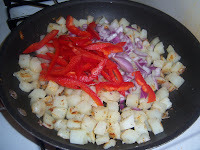 Veggies of your choice - leftover veggies work great, otherwise you can use broccoli, spinach, peppers, onions, diced potatoes, asparagus...whatever you have around! 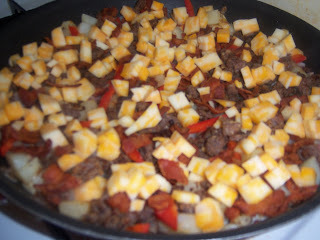 2 cups of finely cubed cheese - I used co-jack b/c it's what I had on hand. I find that cubed works better than shredded. Shredded cheese gets "lost" in the mix...you get little pockets of gooey cheese when it's cubed. Garnish - fresh diced tomatoes & diced scallions are my favorite. Fresh herbs are fantastic, but they aren't in season here in Chicagoland right now. Preheat oven to 375 degrees. 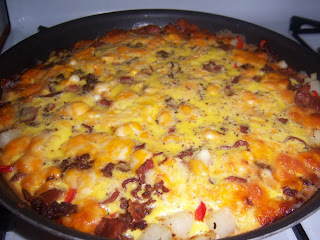 You will need a skillet that can transfer to the oven for this recipe. If you're using potatoes (like I did tonight) start those first. Get the pan hot, drizzle a bit of oil and get them going first. 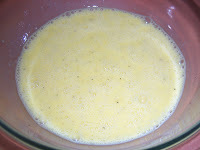 While they are cooking, crack your eggs and add the milk + salt/pepper & Mrs. Dash. Mix well. 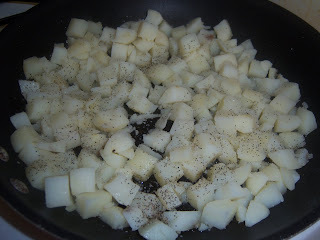 Once the taters are nearly cooked & starting to brown, add in your veggies ( if you aren't using potatoes, just skip this step and start with the veggies). 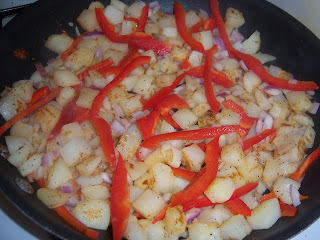 I used peppers & onions tonight. Cook for a couple more minutes. 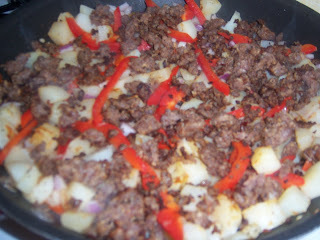 Once things start to soften, top that mixture with your protein/meat evenly. 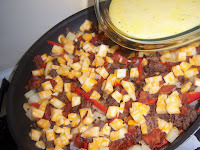 Next, spread out the cubed cheese evenly over the mixture. 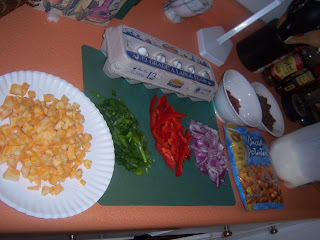 As soon as you put the cheese on, cover the entire pan evenly with the egg mixture. 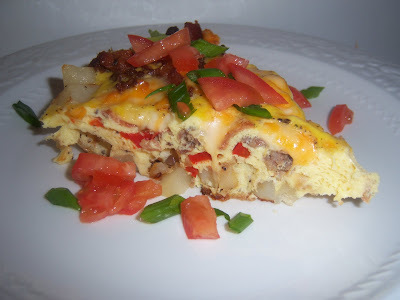 Give it a shake to make sure that the eggs are evenly distributed throughout the pan. Pop it in the oven for 30 minutes at 375 degrees. When the timer goes off, take it out and LET IT SIT for about 10-20 minutes. Slice into wedges as you would a pizza. Garnish with green onions and tomato (or fresh herbs if you have them). This is great with a little side salad, but since my hubby doesn't "do" salad...we just eat it alone. And it's good enough to stand alone. I got my eggs for free with a coupon...so this is really an economical meal. The leftovers are great for breakfast the next day. We had a guest over for dinner and he went back for seconds. It's a hit wherever I bring it. Perfect for Easter brunch! Like I said, it's more of a method than a recipe. I hope you enjoy it as much as we do. 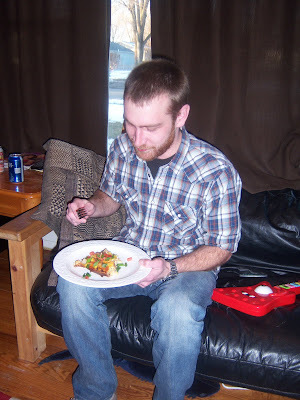 Okay - need to say that was Kyla...just realized it comes from Mike because it's his google account. LOL! "This meal was absolutely amazing. Honestly, words can't describe. I went back for 2nds and 3rds. I'm a huge fan of anything with bacon in it, but this was definetly nirvana; not to mention I got to eat with the chef herself. 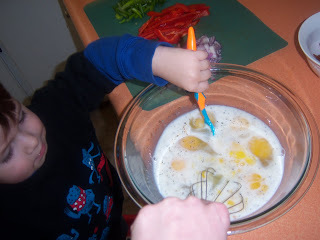 I'm looking forward to more of anything that the frugal gourmom can dish out."